We anticipated our annual sister trip with much excitement. Neither my sister, Chris, nor I had ever been to the Tetons or Yellowstone, and at over seventy, time was getting short. Our friend from the Chicago area, went with us again this year. Kathy had never been there either. We left at five the morning of September 17th. The temperature was about perfect when we left, though we packed plenty of warm layers because we heard it had already snowed at least once in Yellowstone. We expected nights especially to be cold, possibly below freezing. For health reasons we determined to stop every two hours to stretch her legs; a Love station in Wichita was our first. Chris bought a scarf, saying, "Let the purchasing begin." We are again using the application called Let's Go Dutch to keep track of our shared expenses. The sky was lightening by the time we were on the road again. Salina, Kansas was our next stop. From there we took I-70 headed west, through miles of sorghum fields, wind farms, and what we took for flint hills. Kansas is not the most interesting terrain, but there is something to be said for a road that is straight. We were surprised how good the salad bar was at Jane and Chet's Cafe in WaKeeney, Kansas. They had a beef and homemade noodles soup that was really yummy. Before we got on the road again, we filled up the tank. We spent a lot of time collaborating on a very silly limerick of sorts, which the content of is probably best forgotten, but it did make the miles go faster, and in Kansas, you need all the help you can get. Through the rest of that state, we played a game of "Fortunately Unfortunately," and laughed our silly heads off until we said goodbye to Kansas. We crossed into Colorado about 2 in the afternoon. At one point in the afternoon we discovered that we were ahead of schedule, so we made a reservation in Laramie Wyoming at a Quality Inn and canceled our reservation at the hotel north of Denver. We estimated that we should get there before 7 and that would give us more time for the next day through Wyoming. Besides the likely photo-op stops, we will have time to get groceries and get settled in our little cabin in Kelly before it got dark. We stopped in Limon, Colorado around 2:30 PM Colorado time for a rest stop and again north of Denver. 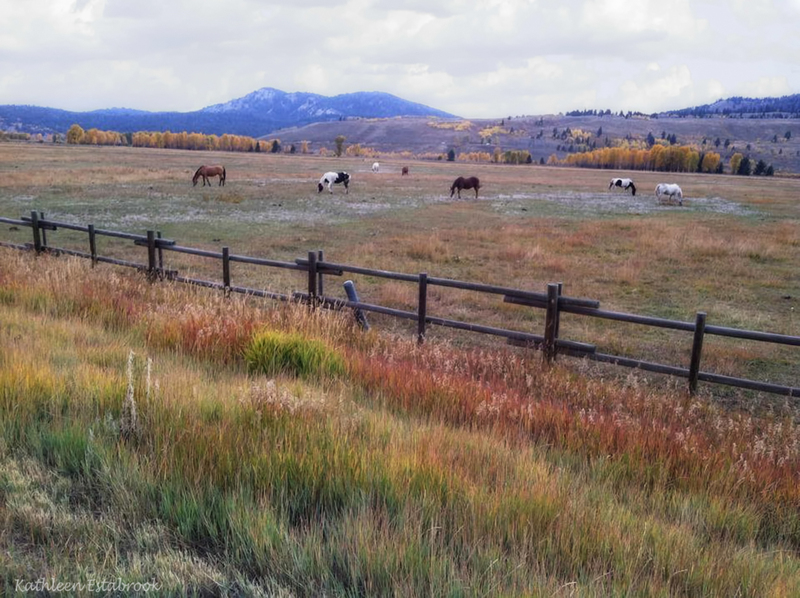 We decided to take a short cut through a more scenic area of Colorado and Wyoming than the Interstate that was marked on our AAA Trip Tik. We were glad we did because it was beautiful; big boulders and scenic outcroppings. We arrived in Laramie about 6 o'clock, Laramie time. We checked into the Quality Inn, and then asked the desk clerk for a recommendation for a place to eat. He suggested Jeffery's Bistro in downtown Laramie. We had a lovely meal at the little bistro and even split a brownie Sundae for dessert. We awoke at 5:15 AM and had breakfast at the hotel, which was less than inspiring. Considering that we usually don't eat breakfast anyway, I guess it was no tragedy. The beds had been comfortable, and we all got a good night's sleep--that was our main objective. We were on the road by 6:45 AM. We saw our first pronghorn antelope at 7:06 AM-our first "wildlife spotting." Afterwards we saw several groups of antelope, but not up close enough to get any photographs where you can actually tell what they are. We overshot our exit at Rawlins because we were going where The Divine Miss Genie, Chris's GPS, took us, which was a route that was maybe just as fast but on an interstate. We went back, however and got back on the route we marked out on our Trip Tik. The Divine Miss Genie did finally acquiesce. We didn't see as many pronghorn as we did earlier but the scenery was lovely, the mountains along the horizon and big boulders and miles and miles of nothing but sage brush and a few trees and a house now and then, and a few horses. We've seen some glimpses of snow-covered mountains. We stopped in Lander, Wyoming about 11 AM at a lovely little restaurant called the Middle Fork. We ate outside by a nice little stream, and had a wonderful meal. We stopped in Dubois, Wyoming to fill up with gas and they had Mouse Tracks ice cream, so well, you know. We had to have some. We made a grocery list so we can get our groceries before we get to Kelly since we plan to cook most of our meals and take sandwiches up into Yellowstone Park for lunches. We got in the Teton National Park a little before 4 PM and the scenery was magnificent. We took the Snake River overlook even though it was misting. Beautiful! We had light rain part of the time and dark clouds part of the time, so we got to see the Tetons in bright sunlight and cloudy, too. Wonderful! We got our groceries at Moose at a little grocery store. The prices were ridiculously expensive, and the selection was very poor, but it was closer than going to Jackson Hole. We got to our little house in Kelly about sixish and unpacked and then quickly made some spaghetti, and ate our evening meal. We loved the little cabin. We each had a bedroom and there are two bathrooms. It was very roomy-so much bigger than Chris and Kathy expected. It has a dishwasher, washer and dryer, ironing board and iron, fully equipped kitchen. The owner came by to collect the second half of our rent for the week, and to introduce herself. She seemed to be a nice lady, and quite willing to help in anyway she could. I called Warren to let him know that we arrived. It wasn't a very clear connection, but at least he knew we were fine. Kathy and I walked around Kelly while Chris had breakfast back at the cabin our first morning. Kelly is situated in a beautiful area. The aspens were bright yellow and we had a great view of the Tetons. A mist was settled in front of the mountains that first morning. It was a beautiful. Yellowstone was calling, and we were headed out at 7:30. We drove in and out of pockets of fog into lovely morning sun as we drove north. We stopped at one point when we saw a man with a tripod taking a photograph. We looked carefully to see what he was seeing and saw at least three big birds. When we asked the man what kind of birds they were he said, "What birds?" We learned later they were sandhill cranes. We stopped at Ox Bow Bend, a beautiful river meandering through yellow aspen with the Tetons in the background. Beautiful. We got gas at a convenience store in Teton National Park. Our car got in free to both parks because of our senior National Park pass. The cabin in Kelly was much farther away from Yellowstone than we had thought, but it was a beautiful drive and we had all week, plus we loved our cabin so we were not sorry we were staying there. It was 9:47 by the time we entered Yellowstone. The skies were overcast and it was a little chilly. They gave us a map of the park at the entrance and told us part of the road that is the main loop is closed. We stopped and took several photos of the Lewis River, and then again at Lewis Falls. We stopped at the Yellowstone Visitor's center and had the guy mark some places on the map that he considered "must see" sights. West Thumb Geyser Basin was our first geyser stop. There was a long boardwalk that meandered among the little bubbling pots in the ground. Two or three were next to Yellowstone lake, a very sizable lake. The geysers were interesting, but I couldn't say that they were beautiful. If you have seen one geyser that is not erupting at the moment, you've pretty much seen them all. We ate the chicken and cheese sandwiches that we made and packed that morning at a sunny picnic table at the Geyser Basin. They tasted good-we were really hungry. It was nice to not have to look for a restaurant. Hayden Valley and Mud Volcano sixteen miles farther was next. On the way we saw a sign that said rapids, so we stopped and there was a great boardwalk that went down along a river. I think it may have been LeHardy's Rapids on the Yellowstone River. Mud Volcano was basically bubbling mud pits and steamy pools, plus a geyser at the mouth of a small cave that was called Dragon's mouth. It was intriguing, but again, it was not beautiful. 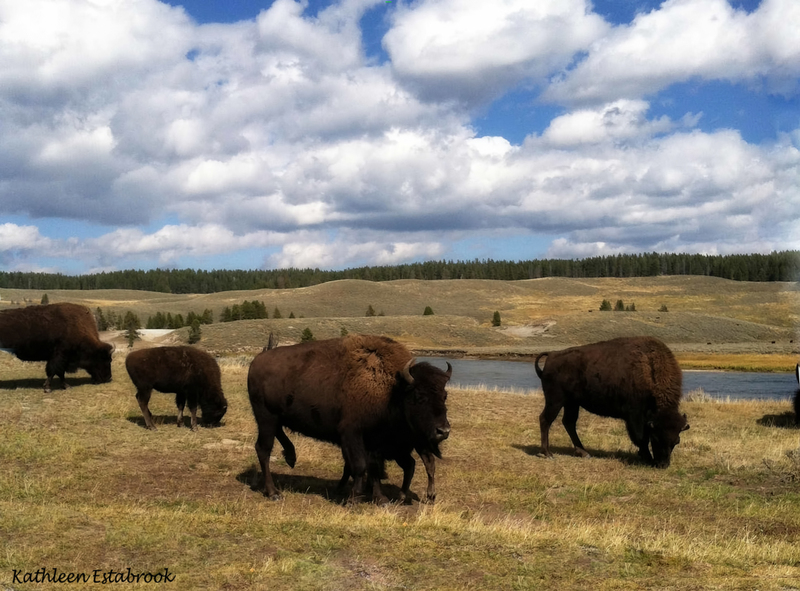 We were hoping to see lots of wildlife at Hayden Valley, but only saw bison-oodles of them. Some of them were crossing the road right in front of our car. Otter Creek was our next stop. It looked like a proper river, and so peaceful. The last thing in Yellowstone we saw that first day was the Upper Falls. It was wonderful-and loud. It was past 3 PM, though, and we thought we better head back to the cabin. It would already be late by the time we got home, made our supper, and ate. And there was the rest of the week to go. We were getting hungry by the time we left Yellowstone. We still had the Teton park to drive though, so we stopped for coffee and a snack to keep us going until supper. We decided to make spoon bread and a salad for supper, and assigned tasks so when we got back, we could get it in the oven quickly. On our way we saw more pronghorn antelope and bison. The bison were less than 5 miles from the cabin. We made spoon bread and a really nice salad for supper. There was just one serving left. We rested, downloaded pictures from cameras and watched a slide show of our first day in Yellowstone. We woke early with the intention of getting away at 6:30, but by the time we showered, made sandwiches, and did other morning chores, it was 7 by the time we got away. But we tried. We weren't even a block from our cabin when we saw some deer, two bucks and one doe. Then parts of a couple old wagons. The deer were too fast to photograph, but luckily the wagons posed nicely. There were pronghorn not far from the cabin, too. Of course there was always the Tetons to take pictures of. We saw more pronghorn later on too, but never close up like the bison. As we drove up toward Yellowstone again, we stopped at some of the same places we had the day before, but we told ourselves the light was different. Anyway, we didn't make any better time than we had the time before. The Tetons are beautiful, as is the whole area of Jackson Hole. The Lower Falls area had been where we left off yesterday, so that was our first extended stop. It was wonderful, a river way far in a valley with rock walls, and the view of the falls far below. We think that general area was what they called the Grand Canyon of Yellowstone. It was a great stop. There were trails going down to the brink of the falls but not being young, we thought better of going down. Another stop farther on had a great view of the valley and river. Magnificent! It was after noon by the time we were on the road again and headed for Old Faithful. Because of the closed road there was only one way to go-the long way. We got to Old Faithful about 1:20 PM and asked about when the next eruption was supposed to be. We had an hour and fifteen minutes to wait, so we ate our lunch in the car-the only shade where we could sit down that we found. When it was nearly time we walked over and sat down to wait. I called Warren while I was waiting. We were just about finished with our conversation when Old Faithful started doing it's thing. It was interesting, and if one hadn't expected it, it would have been awe inspiring, but we were a little underwhelmed. When you've seen it erupt once, there would be no reason to see it again. After it quit, we went to the visitor's center and had ice cream. I'd have to be honest and say I enjoyed that more than seeing Old Faithful. It was wonderful, but also very expensive. Kathy had a root beer float, which looked almost as good. Before we left, Chris bought a T-shirt because she had worn a sweater and was burning up. It was about 3:30 when we finally started back. We stopped at Fairy Falls but the hike was too long, so we kept going and stopped at Gibbon Falls, a nice stop. It was a decent falls and we got to see it from several angles. The road home that would be the shortest was closed so we had to go the long way around, the way we had come in. We almost hit a deer around Lake Village. That's a real wake up call. We slowed down a bit after that. We totally missed Lake Village. We were really wanting a cup of coffee. Then when we got to the next opportunity to get some at 6:00 they were out of anything but weak blonde roast, and the bathrooms were locked. We went on without taking a potty break and getting coffee. Bummer! On our way home we all decided that, although there is much there that is beautiful, we had seen enough of the Yellowstone Park to satisfy us, and that the next days we would do the Tetons and maybe take tomorrow as a sort of lazy day close to the cabin because we've been in the car almost nonstop for four days. We finally did get some coffee (and some chocolate) at the convenience store that we have visited twice already. It was after 8 PM when we got home. We made homemade tomato soup and grilled cheese sandwiches for supper. They tasted so good. After downloading some photographs, we went to bed around 10 PM or so-and didn't set our alarms. We got up in a leisurely fashion this morning and took a walk around Kelly. 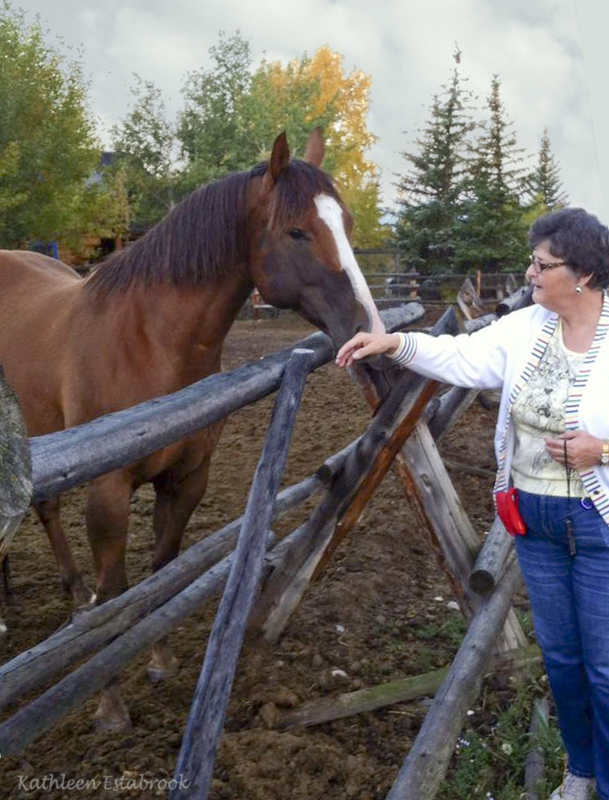 There were two horses just a few yards from our cabin and we got acquainted with them. There are just a few houses-several have Indian prayer cloths strung along lines. Then we came back and looked up in our tour books, notes, and the Internet what there is to see around the tiny town of Kelly, finally deciding that a visitors' center would probably be the most helpful. At about 9:30 we took out to see what was south of Kelly in the Tetons, heading first for the visitor's center in Jackson, WY. An older lady on duty there gave us several ideas of things to do in the three days before we start back on Wednesday. From there we went by the Alberston's grocery store in Jackson and got pretty much what we would need for the rest of the vacation. We went to the National Museum of Wildlife Art on the road from Jackson. It was a wonderful Museum-beautiful art. It did cost $10 admission, but we all enjoyed it, and they let us take photographs. We drove back to the Kelly cabin to make lunch. We loved how everything in the Tetons is fairly close together-unlike Yellowstone. We made Rigatoni with Chicken and toasted Italian Baguette. We had leftovers for another meal. 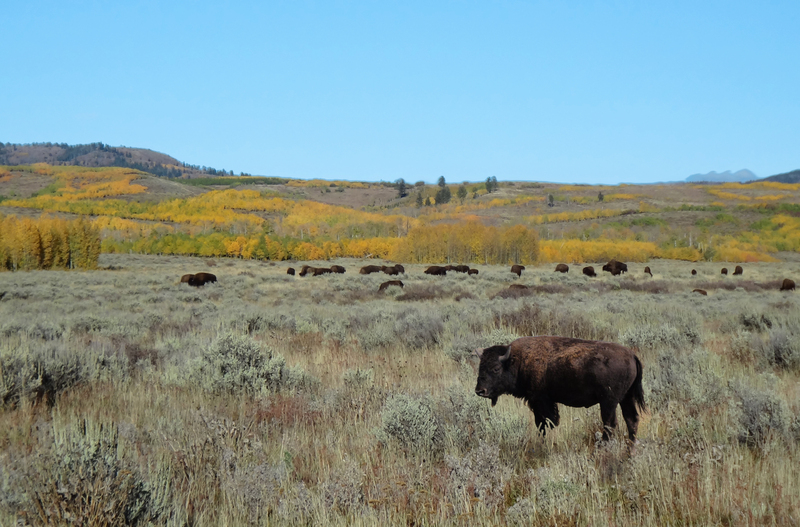 We were no sooner on the road again that another herd of bison crossed the road. It was no longer a novelty. We stopped at the Chapel of the Transfiguration. The big window at the front of the chapel has a beautiful view of the aspens with the Tetons behind them. What a beautiful place for worship services. Next we headed for Jenny Lake Junction. The boat house that takes you via boats across the little lake where there is a waterfall after a half-mile hike, and then back-closes at 4, so we could have gone but not come back, and we are not up to the hike around the lake. We decided to do it the next morning. It cost $12.00 for seniors. We decided to try to drive up Signal Mountain. 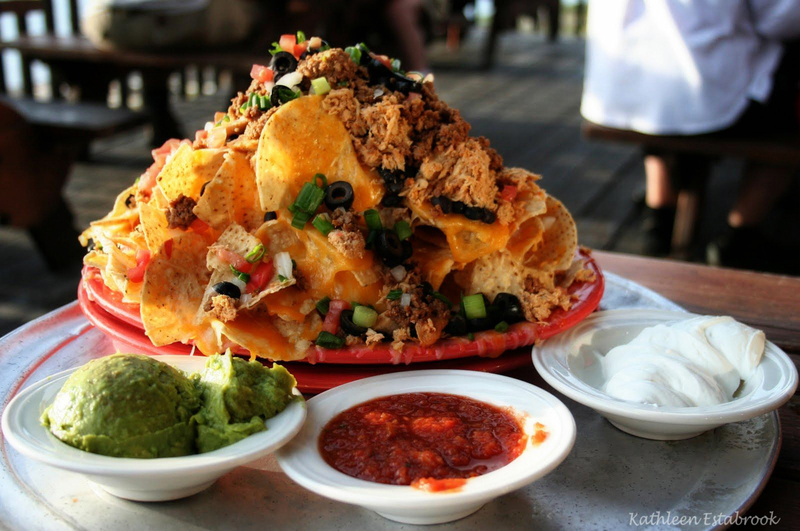 But first we went to Signal Mountain Lodge and had an enormous half order of nachos and Moose Tracks ice cream. We were glad we were warned by Jane, the owner of our cabin, not to get a full order. Even with a half order, we took home enough for another meal. It was cloudy when we drove up Signal Mountain, and so we didn't get the sunset pictures we were hoping for, but it was lovely all the same. By the time we got back to the cabin it was dark, but we had already eaten, so there wasn't a meal to prepare the way we did last night. We downloaded photographs and played hand and foot until bedtime. We decided to go to the little coffee house in Kelly for breakfast only to discover that they were not open. Jane had told us that the coffee house did not keep strict hours. It was kind of a rainy morning, and we had real doubts about whether we could take the boat ride and hike at Jenny Lake, but we drove the 20 miles up that way anyway and decided to have breakfast at the Jenny Lake Lodge. Considering how far everything is in Yellowstone it seemed a reasonable distance. It rained on our way, but we reminded ourselves that we can still have a wonderful time together even if it rains. The Divine Miss Genie took us on the long way around to Jenny Lake, adding quite a few miles and more than a little confusion for me as I was trying to follow on my phone map app, and nothing was making sense. We saw three elk on the park road ahead of us, but they walked into the woods where we couldn't get a decent shot of them. But at least we saw them. When we got to the Lodge, the buffet was $26 a head, so we decided against eating there. A falconer was there, however, with a golden eagle, a great horned owl, and a Sayer Falcon, and it was interesting to visit with him for a while. We went on to the boat dock to get coffee and something at the store but they were closed for the season. It was chilly and very misty and we decided against the boat ride. If it was nice the next day, on our last day, we thought we might try it again. The day was starting to look like a comedy of errors. 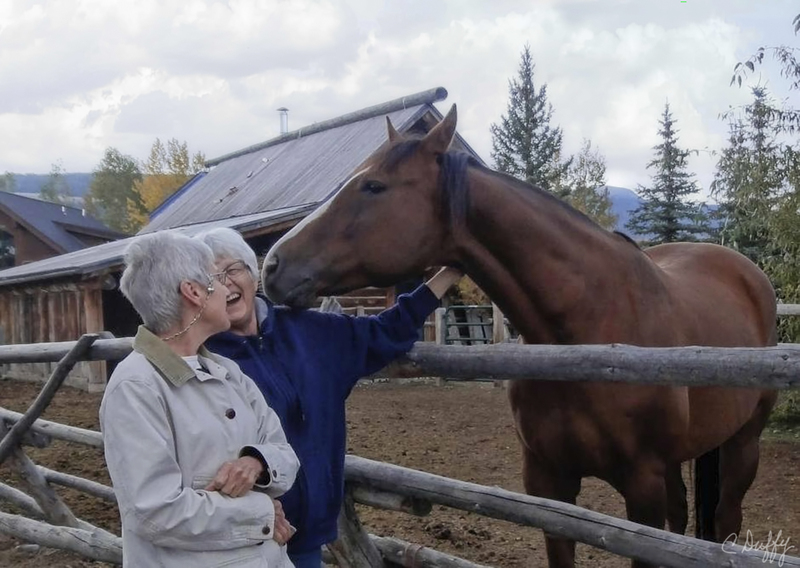 We drove on to Moose, Wyoming and the Craig Thomas Discovery and Visitor's Center where we watched a movie on the Grand Tetons. It was quite interesting, but when it was over it was raining again and time to drive back to the cabin in Kelly. For lunch we heated up the left over nachos and made cheese sauce with Rotel Tomatoes and cheese we had for sandwiches. Chris had brought along some refried beans, so all together it was a wonderful lunch, actually better than it had been on Signal Mountain. During our lunch, it began to clear off outside slowly. About 1:00 we got in the car again and went to see Mormon Row close to Kelly-a road we had seen the sign for many times, and we had been led to believe had some historical significance, and hopefully some old homesteads. It was ill-advised all the way around. The road was a muddy mess and I was really afraid we would get stuck in the mud. We got through, though, and took a picture of the only barn, the only building on Mormon row, which was clearly visible without even getting on the road. There were cars stopped looking at some bison at the barn, and there were several people out of their cars taking photographs, so we got out too. I was watching Chris and had just warned her not to get too close to a calf with its mother, and she had turned to go back to the car when a huge bison charged her. I screamed, Chris ran, and the bison kept coming-and came within a couple feet of her. Chris could have so easily been gored but the bison was content to scare the bejesus out of us, and swerved off at the last split second. Chris was shaken up, understandably. We were all shaking. It was way too close. After that Chris didn't get out of the car when we saw wild life. We went home to freshen up a bit and then thought we'd try the coffee house again just to see. They were closed again-or still; who knows. It was raining again when we headed south to Jackson again. Perfect! By the time we got to Jackson, however, the rain had stopped. We needed to find a car wash because the car was filthy from Mormon Row road, so that was our first order of business when we got to Jackson. We asked at a gas station, and it was just next door at a Shell Station. We got the Ultimate Car Wash so the underside would get cleaned, too; but we had to go through twice and have some hand work done on it to get all the gobs of mud off it. Even at that, we heard clumps of mud fall from the undercarriage several times on the road home. We went to the Bar J Ranch outside of Jackson and ate a chuck wagon supper and saw a really fun show by the Bar J Wranglers. Chris had been very dubious about the show because she doesn't like country music and thought cowboy music was the same, but she loved it, too. She insisted on paying for all three of us. We got home pretty late, but really enjoyed the evening. Chris and I both bought CDs by the group. We didn't set our alarms this morning, and slept until around 7:30. We made french toast with walnut syrup for our breakfast, and then took out around 8:30 for Lake Jenny to try to cross it again. It would be our third time and the last chance to see Hidden Falls. We had to wait a few minutes behind a bus load of orientals to buy our passage-unsure if there would be room on the first boat, but there was, and we were taken to the other side of Jenny Lake. The hike was difficult, but oh, so worth it. There were actually two falls. The first was half way up the half mile hike, and the other at the end. The path was really difficult and if we had not had our walking sticks that Chris bought new for this trip, we would not have been able to climb it at all. 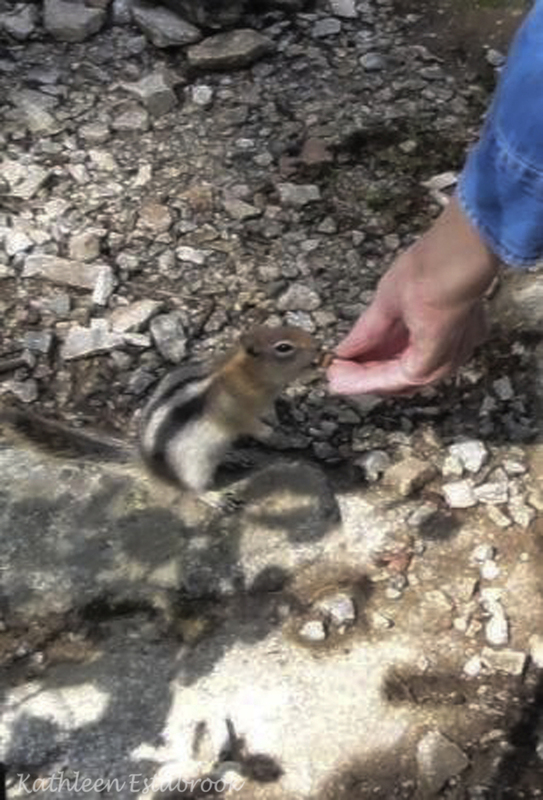 At one point on the hike, a little chipmunk kept coming up to us, obviously wanting us to give it something to eat. I had nothing but a piece of hard candy. He took it, and seemed to be enjoying it last I saw of him. A meal of leftover Rigatoni was waiting to be heated up back at the cabin for our lunch. We made a wonderful salad to go with it. Then we were ready to go again. Chris wanted to take in some of the overlooks we hadn't had time before since this would be our last chance, so we went up to the Blacktail Ponds Overlook first. There was a beautiful View of the Tetons and the valley below. We also took the Glacier turnout, with a nice view of the Tetons. Schwabacher Road was next, it was a gravel road that went down to a river, and we really liked it. We took a short hike along the river and saw beaver dams. The Snake Overlook was our last stop, and it turned out we had already seen it, we think the first day driving in. It was a little overcast and rainy that day, so the pictures we took were different. It was only 4:00 but we decided to call it a day, and headed back to the cabin to get organized for our trip home. We did a load of wash to have clean jeans on the way home, made potato soup, downloaded pictures, assembled a salad and ate around 7:30 PM. We were all still worn out from the hike that morning, so we packed what we could and went to bed early. We also packed sandwiches for our lunches since we had bread, meat, cheese and chips left. We planned to get started at first light the next morning. It would be the first of two days driving home. We got up and got away about 6:45 before the sun rose over the mountains. The sunrise was beautiful even on the Teton side as we drove north to our highway. We stopped for Gas after we got on the highway and took a picture of humorous moose and a bear wooden sculptures at the gas station-two animals we had not seen. A sign announcing open range caught our attention for the first time, but we didn't see any cattle on the highway. We drove by some jagged mountains that weren't the Tetons, but we weren't sure what they were, then drove through the Sheshone National Forest. We stopped in Debois for Moose Tracks ice cream and coffee for our breakfast. Yes, breakfast! As we stopped numerous times to take photographs, and then we were stopped for a long time due to construction. It slowed us down quite a bit as we waited and then followed a pilot car along a dirt road. We wondered what kind of time we were making. To pass the time, we played the CDs we bought at the Bar J Show, and a couple others that Chris had-and had a good time singing along to them. We saw three antelope on the highway, and when we approached they went under the fence, not over. We stopped in Rawlins Wyoming to eat the sandwiches we brought along, then got a coffee and took Highway 80 east toward Laramie, Wyoming. When we saw that we were going to get to Colorado late afternoon, we tried to make a reservation is Limon, but, alas ,they had no roll-away bed, so we kept our reservation north of Denver. We got to our hotel about 5:30 and rested a bit then went to eat at Pinocchio's, a really nice Italian restaurant in Longmont, Colorado. Kathy and I had eggplant parmesan, and I had Tiramisu and was so full I would have trouble going to sleep that night. But it was a nice meal and we enjoyed ourselves there a lot, though it was a little on the expensive side. We came back to the hotel and all got on WiFi and caught up with Facebook and such. Our Internet access has been very spotty since we've been gone, so it was nice to have a reliable connection all evening. We were on the road at 6:40 in the morning, our last day. My maps app on my phone says that it will take us over eleven hours and that is without lunch, so we shall see. We listened to Cowboy music all the way to Kansas, and then we played Fortunately-Unfortunately until we got to Hays, Kansas, where we ate our sandwiches in a little park. We resumed our game afterwards. South of Salina, Kansas we played another travel game where we name foods and the next person has to think of a food starting with the last letter of the previous word. Then we played Would You Rather. The games sure helped to pass the time. We stopped in Guthrie to get something to eat so we wouldn't have to pitch in and get a meal when we got home. We arrived in Oklahoma City around 7:00 PM and happy to be home.